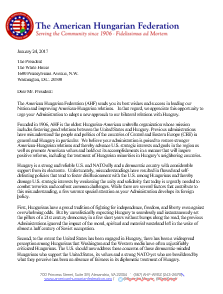 05/30/2018 - AHF issues statement on US strategic interests and improved American Hungarian relations: "A proposed intervention last November by the Department of State into Hungary’s media environment is emblematic of the misguided policy that represents a risk to U.S. strategic interests and therefore deserves thoughtful scrutiny." A proposed intervention last November by the Department of State into Hungary’s media environment is emblematic of the misguided policy that represents a risk to U.S. strategic interests and therefore deserves thoughtful scrutiny. This review is especially needed now that the Hungarian ruling party, Fidesz, and its Prime Minister Viktor Orbán won a sweeping victory in April’s national election. Even before the election, U.S. interests had already been eroded by the barrage of public criticism leveled against Hungary and its Prime Minister by numerous representatives of the American media and foreign policy players even though it is a strong and reliable U.S. and NATO ally. Now the targets of the public criticism have been given a strong mandate by the Hungarian voters. Will the U.S. tweak its policies in furtherance of its interests and take the political realities on the ground into consideration? It can be hoped that last week’s meeting between Hungarian Foreign Minister Péter Szijjártó and Secretary of State Mike Pompeo turned the page on U.S./Hungarian bilateral relations. Nevertheless, in an unparalleled step, the Department of State’s Bureau of Democracy, Human Rights and Labor (DRL) on November 7, 2017 chose to go beyond public criticism and announced its intent to take active measures to directly intervene in Hungary's media landscape. The DRL proposal ignores that Reporters Without Borders, a respected NGO that monitors the state of the press around the world, ranks Hungary’s press freedoms above that of Japan and Israel, both allies of the United States. Yet there is no hint of any intention by the Department to support “objective media” in those countries. Nor is the proposal without its ironies, as the U.S. has recently denounced Russian Television (RT), which is broadcast internationally and partially financed by Moscow, as foreign engagement in America media. This planned action directed at a NATO ally and democratic country, classified as such by the State Department, is not only unprecedented and objectionable to Hungarians, it is inconsistent with the Administration’s articulated foreign policy goals and is contrary to U.S. interests in the region. The issue is not about the respective merits of media freedom. Its advancement, along with the full rubric of human rights, has long been an internationalized priority subscribed to by all the democracies of the world. Nor is there any question that after only a few short years of regaining their independence from Soviet oppression Hungarians can themselves take steps to strengthen civil society and democratic institutions there. What should be questioned, however, is the efficacy and wisdom of directly intervening in Hungary’s political and media environment and incessantly and publicly criticizing and lecturing Hungarians as they struggle to solidify a working democracy. This holds true especially in those instances when the criticism is not based on facts and is not free of what is perceived to be political bias. Having regained their sovereignty and independence, many Hungarians are not about to acquiesce in what they view as an attempt by outsiders to impose their political preferences. This should be seen as understandable in view of their uprisings and wars of independence against the Hapsburgs in 1848 and most memorably the Soviet Union in 1956 in a “shot heard round the world” in the very spirit of the American Revolution. Hungarians also played a key role in helping to dismantle the Iron Curtain in 1989. But rather than swaying public opinion in Hungary, the Department’s interventionist policies are seen as demeaning and humiliating, with the Hungarian man-on-the-street seeing them as resembling yet more dictations from the Great Powers. In fact, DRL’s proposed actions have tinges that are reminiscent of the Cold War, when on December 27, 1977, former CIA Director William Colby testified about the Agency’s actions to influence politics in other countries through the media: “Obvious ways to exercise influence have been through foreign newspapers and other media,” he said. Winning over Hungarian public opinion to support these policies, instead of inviting alienation by openly intervening in Hungary’s politics and media, is critical to advancing these vital American goals and aspirations. For positive bilateral relations between the United States and Hungary, as well as a strong and united NATO, are in the interest of both countries. Both are necessary to successfully confront formidable regional challenges, which include a neighboring and aggressive Russia not reconciled to loss of empire, ongoing terrorist threats, the denial of rights of Hungarian minorities living in states adjoining Hungary, and other crises. The key question, therefore, that warrants re-examination is whether there might be better means of communicating U.S. concerns – to the extent they are warranted -- than ongoing public criticism and escalating interference in Hungary’s internal affairs. These are hardly likely to yield productive results but are more than likely to alienate a friend and NATO ally willing to exercise a “leadership role on behalf of international peace and security,” the very role Senator McCain has envisioned for Hungary. In conclusion, explaining and sharing American values and accomplishments without unduly intervening in Hungary’s internal affairs under the guise of promoting democracy would do far more to advance U.S. interests and policy goals in the region than the current approach. Bi-lateral relations would be bolstered while NATO would be strengthened. The stakes for both the United States and Hungary are high, and as such they warrant a reevaluation of U.S. policy toward Hungary before any counterproductive initiatives, such as the one proposed by DRL, are implemented. *Frank Koszorus, Jr., is an attorney and consultant and follows developments in Hungary. He is the Chairman of the Board of the 111 year old American Hungarian Federation. He has lectured; written; debated; testified before congressional committees; and briefed officials concerning Hungary. In 1997, Mr. Koszorus travelled to NATO headquarters, Hungary, Poland and the Czech Republic on a fact-finding mission sponsored by the U.S. Departments of Defense and State on NATO enlargement. 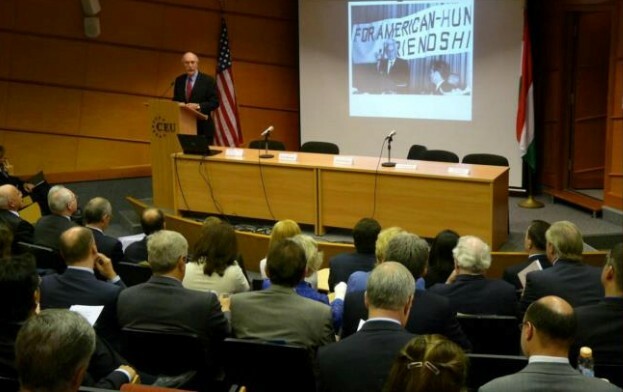 He also served as a public member of the U.S delegation to the Paris Conference on the Human Dimension.